Is Fear of Public Speaking limiting your life? Are there presentations, interviews or group discussions you should be participating in, to further your career or personal ambitions? What is the true cost of your fear, in terms of loss of opportunity and self-image? Stage Fright is not only a serious issue for actors and performers. Everyone has to speak in public at some time in their live! Wedding speeches, interviews, chairing meetings and formal presentations are all events that nerves can destroy. 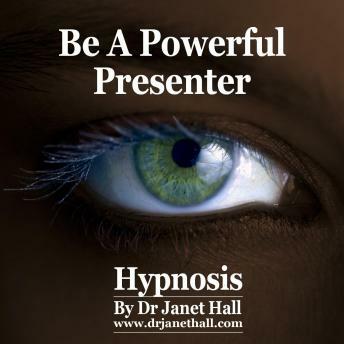 Dr Janet Hall's "How To Be A Powerful Presenter With Hypnosis" audio was created to change your mind's perception of these events, and by changing your perception, you change your thoughts, feelings and reactions. Imagine the first time you walk into a presentation feeling calm and capable, with that old negative reaction gone! It's happened already for many, and it CAN happen for you. Frequent listening to this recording will create a sense of being in control, calm and relaxed any time you need to speak, no matter the size of the audience or the venue. Dr Janet Hall's "How To Be A Powerful Presenter With Hypnosis" audio can help to soothe stressful emotions that can hinder you when you need to perform at your best. You'll notice the difference quickly as your nerves calm down, leaving you able to give a great show every time! Simply sit back and listen as Dr Janet Hall helps YOU take back control and deliver the performance of a lifetime.  Stand tall and strong in front of your audience!  Share your thoughts proudly and freely!  Perform at your best when required. So, if you're serious about wanting to perform in public at your best, then you need to get a copy of "Be A Powerful Presenter With Hypnosis" right now! Enjoy the excitement of public speaking!